Yesterday morning a council van arrived on the street and parked directly opposite my house. This was about half past eight. There were two workers in the cab. Somebody's keen, I thought to myself. After watching them for ten minutes, I realised that they weren't particularly keen. The driver had settled down to read his paper and his mate was munching his way through some sandwiches, the crusts of which he dropped out of the van window. They were still sitting in the same position at half past nine. The crusts and the van occupants. Seriously. They had sat for one hour and not moved out of the van. At half past nine, there was some activity. The guy in the passenger seat got out and pulled on his overalls. He then walked up the path of the house opposite and knocked on the door. There was no reply. After waiting a minute or two, he got back into the van. A quarter of an hour passed. Then there was some more activity. Both men got out of the van. The driver put on his overalls while the other stood watching. They then both put on some kind of harness things and hard hats. After a few minutes of chatting to each other, they began to haul a tarpaulin off the cargo area. They then stood chatting with each other for a few more minutes before starting to haul various pieces of scaffolding off the truck and then carry them round to the rear of the house. By now it was ten o'clock. When the truck was empty they replaced the tarpaulin and removed their protective gear. At a quarter past ten, they drove away. At half past ten another identical vehicle arrived. It had more scaffolding on it. The two guys in this vehicle didn't seem too concerned about safety and just hauled a few bits of scaffolding off the truck and carried it round to the back of the house. That van was only there for about five minutes when it was off again. At about eleven o'clock the first van came back with the same/original guys in it. Again, they sat in their cab for about a quarter of an hour before climbing out and donning their overalls and safety gear. After the usual ten minute chin wag, they walked round to the back of the house. Whatever they were doing, took them less than half an hour because at ten to twelve, they returned to the van, removed the safety gear and were gone. It must have been lunch time. Did they return after lunch? Did they f... no they didn't. Presumably, whatever job they had been there to do was complete. So the whole morning consisted of about one hour of actual work while the rest of the time was spent chatting, reading newspapers and eating food. A few months ago there was much activity around the streets of Polomint City as council ‘cherry picker’ vehicles arrived. Every street lamp was being altered from sodium vapour lights to light emitting diode type. It was a simple enough job, it seemed. A couple of weeks after converting all the lamps in the street where I live [Isn’t that a song? - Ed. ], more council workers appeared in vans and pick-up trucks. Why? To replace the old lamp-posts witth shiny new ones. Honest. I am not winding you up here. That is exactly what happened. Two weeks after being upgraded, all the old lamp-posts were ripped out. Not quite all. At the end of the street there is still one of the old lamp-posts. Did they forget to replace it? No, three feet away from it is a brand-spanking new lamp-post. The old post doesn’t have a light on it any more. So why is it still there? I’ll tell you. It has a little metal plate with the street name attached to it. I am guessing that another department within the sprawling council deals with street name signs so, rather than move the plaque to the new lamp-post, it has presumably been left for another team to come and sort out. A man is sitting at his front window (not me this time) looking out at the main road which runs past his house. He sees a council van draw up and two workers emerge. Each carries a spade. One begins to dig a hole in the grass verge. He then moves on a few yards and starts to dig another, similar hole. Meanwhile, the second worker takes his shovel and fills in the first hole. The first worker moves on and digs a third hole and the second guy fills in the second hole. This digging and filling in routine continues for some time before our observer can take it no more and goes out to confront these two, in his mind, idiots. Boom and, I think it goes without saying, tish. Last week it was Barca that had a terrific comeback to qualify for the quarter finals of the Champions League; this week it was Monaco who staged a brilliant comeback. Although you perhaps wouldn’t have realised it. You see, Monaco staged their comeback against a British (sorry, English) team. And? It was typical of the British (sorry, English) sports commentators that after this week’s Monaco vs Manchester City game, with Monaco clawing back a two goal deficit from the first leg to qualify for the quarter finals, all they could talk about was Manchester City not qualifying and how manager Pep Guardiola had never before had a team he had coached not qualify for the quarter final stage. There was little or no praise for the fact that Monaco, against the odds, had managed to qualify. Come on gramblerinis, let’s hear it for Monaco. They deserve some of the plaudits heaped on Barca last week... I wonder if Barcelona would have received such praise last week if they had beaten a British (sorry, English) team. Probably not. Were any famous or notorious people born on the 18th of March? Of course. Here are some I’ve even heard of. Nikolai Rimsky-Korsakov 1844 (Composer. He wrote Der Hummelflug. Sorry pardon excuse me? This. ), Rudolf Diesel 1858 (Inventor of, go on, have a guess. ), Neville Chamberlain 1869 (I have in my hand a piece of paper. ), Edward Everett Horton 1886 (Actor - appeared in 121 films in a career lasting from1922 til 1970. ), Wilfred Owen 1893 (Poet - If you could hear, at every jolt, the blood / Come gargling from the froth-corrupted lungs, / Obscene as cancer, bitter as the cud / Of vile, incurable sores on innocent tongues, - / My friend, you would not tell with such high zest / To children ardent for some desperate glory, / The old Lie: Dulce et decorum est / Pro patria mori. ), Robert Donat 1905 (Founder of Krispy Kreme. ), Peter Graves 1926 (Joey, do you like films about gladiators? ), John Fraser 1931 (Ectaw. Always played posh English blokes but was actually a Glaswegian. ), John Updike 1932 (Orfer. Witches of Eastwick. That was one of his. ), F. W. de Klerk 1936 (The larst survahving Stite Prisidunt of Sarth Ifrica. ), Kenny ‘Kipper’ Lynch 1938 (Popular singer from the early sixties. Want a link? Here’s Kenny singing Movin Away. ), Timo Makinen 1938 (The Flying Finn. ), Charley Pride 1938 (We’ve never catered for fans of country and western, so here is Charley with Crystal Chandeliers. 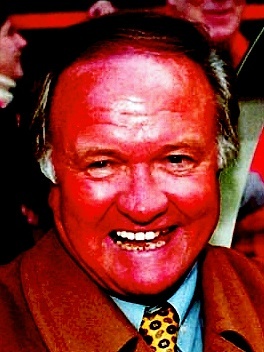 ), Ron Atkinson 1939 (Aka Big Orange Ron. ), Wilson Pickett 1941 (Aka The Wicked Pickett. Time for another link? Okay, if you insist. Here he is In the Midnight Hour. ), Kevin Dobson 1943 (Kojak’s sidekick. ), David Lloyd 1947 (Crickety bloke. ), Pat Eddery 1952 (Horse racey bloke. ), Jeff Stelling 1955 (Unbelievable, Jeff! ), Ingemar Stenmark 1956 (Came down mountains quicker than anyone else. ), Luc Besson 1959 (Film director, producer and screenwriter. Trivia: he wanted to be a marine biologist until a diving accident at the age of 17 stopped him. ), Irene Cara 1959 (Probably doesn’t really believe she’ll live forever. ), Courtney Pine 1964 (Saxophonist/clarinetist. Hey, let’s have another link, to another genre... Jehzzzz... Here is Courtney with Sacrifice. ), Dana Elaine Owens 1970 (Who? You perhaps know her better as rapper, songwriter, singer, actress, model, record producer, television producer, talk show host and right old smarty boots Queen Latifah.) and Danny Murphy 1977 (Footy bloke.). Joe Ralls' second-half penalty put the hosts ahead, after Sean Morrison had been fouled by Ryan Shotton. Birmingham salvaged a point in the 89th minute as ex-Motherwell man Lukas Jutkiewicz bundled in a rebound after his header was saved. Rob Green made a fine first-half save on his 600th league appearance to help Leeds extend their unbeaten run to six games with a goalless draw against QPR. The 37-year-old ex-England keeper crucially denied Conor Washington after the striker turned into space in the 14th minute to race clear on goal. 16-year-old Ryan Sessegnon slotted in Sone Aluko's backheel after the break and then fired home just before the hour mark. Tom Cairney had put Fulham ahead with a 25-yard strike into the top corner. After Daryl Murphy curled in a consolation for the hosts, Tim Ream missed a chance to make it 4-1 when he sent a stoppage-time penalty wide. Cameron Jerome put Norwich ahead early on when he slid the ball past keeper Jason Steele, who had half blocked an attempt by Josh Murphy. Mitchell Dijks' was sent off soon after for a foul on Martin Emnes, but it took until midway through the second half for Blackburn to strike back. Substitute Lucas Joao put the visitors back on level terms in the 73rd minute as he converted from Connor Mahoney's cross before then giving them the lead as he headed in from Danny Graham's delivery. But Jerome joined the Portugal international in claiming a brace as he latched on to Murphy's pass to make it 2-2 at full time. The visitors led from their first attack, defender Luke Wilkinson heading home from a corner after just three minutes. Luton almost equalised after 10 minutes, but Pelly Ruddock's header was cleared off the line by Jack King. Ben Kennedy almost took advantage of a poor free-kick from goalkeeper Matt Macey, chipping over the top. Chris Day denied Isaac Vassell and the Stevenage stopper then tipped over Dan Potts' deflected effort, while Charlie Lee put a good chance over. Steven Schumacher cleared Danny Hylton's header off the line, and Vassell's attempt in the 66th minute went just wide. Day made a superb stop from Ollie Palmer's close-range header late on, and Stevenage clinched victory when Kennedy smashed an effort into the top corner. Well, that was a rubbish week of predictions from The Grambler. Can he/she/it do better this week. I blibbing well hope so. A whole seven pees less whopping than last week..
Teaser time. Yay! Last week I asked which African has scored the highest number of Premiershit goals. I said it was an easy one and so it was given that he had already been mentioned in last week’s birthday honours. The answer was Didier Drogba who scored 104 goals. Emmanuel Adebayor came second with 97 goals, closely followed by Yakubu on 95. Orl right pop pickers? One for this week? In the past five seasons all but one PFA Young Player of the Year awards have gone to Tottenham Hotspur players; who was the only non-Spurs player to have been given the accolade?